The Harrison Apartments, a 360-unit project with two 14-story towers rising in Reston, is a good example of the kind of development coming to this 50-year-old planned community. The towers, which will be ready for occupancy this fall, are replacing three low-rise apartment buildings and will offer the kinds of high-end amenities that attract tenants: a rooftop clubroom and outdoor pool, concierge service, a spa and fitness center, and a conference center. The market for multifamily rentals has been strong for several years and with the Silver Line on its way to Reston, the timing for this project seems good. “The long-term demand is very high, and there’s been a tremendous amount of movement to the rental lifestyle,” says Karen Kossow, director of marketing for CRC Inc. CRC will manage the property for the developer, Renaissance Centro. “For this particular building, you’ll see demand from millennials who want to live in an area where there’s something to do, [or] baby boomers who don’t want to deal with a home anymore,” she says. Adding to the project’s good fortune is the coming extension of the Metrorail Silver Line. The Harrison project also is just across the street from the popular Reston Town Center. “There’s always something going on in the town center, so it has the feel of a smaller area in the city,” Kossow says. 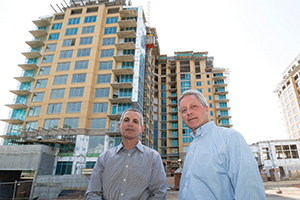 Building that city feel is what’s coming for much of Reston in the near term. With the arrival soon of the Silver Line, which will have two stations in Reston, including one in the town center, developers are planning higher density, mixed-use development. That’s exactly what Reston’s new master plan aims to encourage. Approved in February by the Fairfax County Board of Supervisors, it could double the amount of development. Reston currently has more than 19 million square feet of office space and 1.7 million square feet of retail. Reston got its start in 1960 when Robert E. Simon, also known as the Father of Reston, bought the 6,750 acres that formed the original Reston. The first residents moved to a high-rise tower of apartments and town homes in 1964. Even back then, the development included retail, tennis courts, paths, athletic fields, a community center and golf course, all clustered around a central lake. It was hailed as a city of the future where people could live, work and play. Under the rules of the new master plan, formed by a 25-member task force for more than four years, most of the new higher-density development will be clustered around the three new Metro stations. The first one, the Wiehle-Reston East station, is scheduled to open this summer. It’s the last station along phase one of the Silver Line expansion and the only one with a garage, with 1.3 million square feet slated for mixed-use, transit-oriented development. The Reston Town Center and Herndon stations — part of the second construction phase of the Silver Line — are expected to open in 2018. More residential development will support the office and retail development, and the new master plan allows for plenty — up to 22,000 residential units, 9 million square feet of new office space and 700,000 square feet of new retail, along with 2.2 million square feet of new hotel space. The question, of course, is the timing of any new development, which likely won’t be quick. Jeffrey Kottmeier, director of research and analysis for CBRE, led a study earlier this year on the impact of the four new Silver Line stations opening soon in Tysons Corner. There’s been plenty of new construction around the stations, and Kottmeier predicts an average of 200,000 square feet of net office demand annually through 2017 in Tysons, along with higher rental rates. But it took awhile for things to get started. Among office tenants in recent years “everyone was like, ‘Wow, we don’t want to mess with Tysons’” amid construction of the rail stations and the HOT lanes. “But as we saw some of these stations start to be completed, we saw rental rates firm up,” Kottmeier says. In general the Dulles corridor should see a decent amount of demand for commercial space, which will help in Reston and Tysons, too. Even though projections for federal contract spending are still down for this year, Kottmeier says, Northern Virginia’s financial services and IT sectors are doing well enough. Real estate interests might be happy with the new infrastructure and higher density rules but many Reston residents are not. The Reston Citizens Association opposed the county’s new master plan, saying there wasn’t enough done to handle the increased traffic new development will bring. Plus, they grumble about the plan not setting aside enough open space for parks and recreation. The county is “trying to play both sides, by not having to invest too much in infrastructure but allowing a lot of development,” says Terry Maynard, a leader of the citizens group who also served on the county task force that developed the new Reston plan.